The Minister of Health, Prof. Onyebuchi Chukwu, has said that four additional confirmed cases of Ebola Virus Disease, who have been managed successfully and are now disease free, have been discharged. Those discharged are two male medical doctors and one female nurse. The three participated in the treatment of the index case while the fourth person was a female patient at the time the index case was on admission. This brings to five, the total number of patients diagnosed with Ebola Virus Disease who have now been discharged from hospital. Nigeria is witnessing the grace of GOD Almighty. I believe there is GOD and not ashamed to so declare. Otherwise, how can one explain these recoveries amidst our poor health facilities? Also, have you imagined what would have happened, if Mr. Patrick Sawyer, the Liberian-American, who imported the Ebola disease into Nigeria had attended the Calabar Conference he came for. During the conference, he would have interacted with other participants and mingled with several others persons, including the hotel staff. It could have been horror in Nigeria. I believe that GOD Almighty delivered Nigeria! Nigeria is witnessing the grace of GOD Almighty. I believe there is GOD and not ashamed to so declare. How can one explain these recoveries? Have you, also, imagined what would have happened, if Mr. Patrick Sawyer, the Liberian-American, who imported the disease into Nigeria had attended the Conference in Calabar, where he would interacted and mingled with several persons, including the hotel staff. There is GOD! HE delivered Nigeria from the horror that would have occurred. The. Ebola virus survives in a “reservoir” host – an animal or insect that carries the virus at no cost to itself – and is passed on to other animals or humans through contact with the bodily fluids, secretions or organs of the host animal. Also, it is transmitted “through direct contact, where broken skin or mucous membranes come into contact with the blood or secretions of the infected person” and indirectly “through exposure to objects (such as needles) that have been contaminated with infected secretions” according to the US Centres for Disease Control and Prevention . It is important to state that the following “sneezing, coughing, vomiting, bleeding and diarrhoea facilitate transmission to other victims.” It is worse than HIV/AIDS virus. So, there’s need to be very careful. I commend the Arik Airlines for suspending its flights to Ebola infected countries of West Africa, despite the obvious losses it will suffer. I salute the management and the owners of the airlines for being sensitive to the urgent need to protect lives of persons in Nigeria from Ebola virus. I consider this decision of Arik Airlines as a demonstration of patriotism and respect for right to life rolled into one. I urge other airlines and all transport operators to the Ebola infected countries, to follow the footsteps of Arik Airlines in the interest of the country and persons in it. In the Arik Airlines press release announcing its suspension of flights to the Ebola infected countries, it also stated this: “At the early stages of the contagion’s development across West Africa, the Gambian government took the proactive decision to stop airlines (including Arik Air) from bringing inbound passengers from Monrovia, Conakry (Guinea) and Freetown into Banjul.” I was moved by this statenent. Gambia is not as rich or as powerful as Nigeria, but the country’s leadership (in this case) acknowledged its first duty to the citizens: protecting lives. I salute the Gambian government for this bold and couragrous step. This is a case that requires critical and sincere balancing of right to life and to that of movement, no doubt. I believe that the right to life weighs more. Freedom of movement is meant only for the living. If the Federal Government of Nigeria had acted similarly, the panic and confusion in the country presently might not have arisen as the Liberian, Sawyer, who died of the virus in Lagos could not have entered Nigeria. A grave issue of public health, like the Ebola virus crisis, is worse than terrorism and ought to be tackled with all urgency and seriousness by every responsive and responsible government. So, I call on the Federal Government to act decisively now on the matter. The urgent alert approach is good, but there is need for more proactive actions. I demand that ASky Airline be banned from operating in or to Nigeria for refusing or failing to release its passengers manifest for tracking timeously the passengers that were with its flight with Sawyer, who, on Friday, died of the Ebola virus. This is reckless and insulting to the country, and requires adequate punishment. OUR PEOPLE LIVE HERE TOO! WHAT FUTURE FOR THEM? Urbanization is being confused with development in Nigeria. Governments in this country pay more attention, after looting, to the cities than the rural areas where the greater percentage of Nigerians dwell, especially children, women and elderly persons. The urban areas are targeted because the media will easily report the tokenistic efforts in the cities. The rural areas like urban slums are denied portable water supply, electricity, accessible roads, functional public medical care, etc. 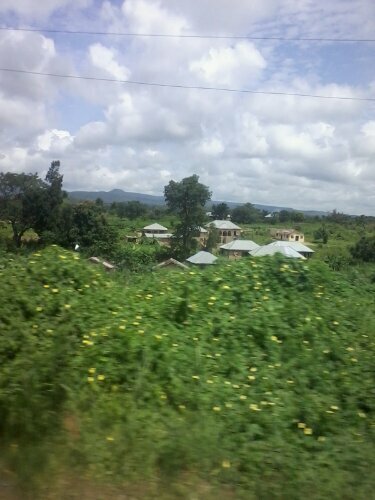 The neglect of the rural areas account for the exodus of many Nigerians, especially the young persons into the cities. This has brought over population of the cities with the attendant social problems like violent crimes, prostitution, drugs, spread of communicable diseases and sicknesses, etc. It is not sweeping to state that there is no sincere drive by governments – Federal, State and Local Government – to address the situation of the rural areas. The neglect of the rural areas has adversely affected internal food production. The rural areas with the peasants tilling the soil have remained the main producers of food for the country. Today, agriculture has declined severely. The new quest of commandeering the land of the poor and rural folks for bogus government agricultural projects, which are mere conduit pipes for corruption, and granting the lands of the poor to the rich without alternatives for them are not solutions. It is like a time bomb that is programmed to explode. The rural poor depend on land for their source of livelihood and housing needs. When they are displaced without comprehensive, concrete , humane and enduring alternatives, they are for life violated and deprived. Someday, they will mobilize and demand for restitution of their lands. So, governments in Nigeria should be called upon to urgently and genuinely address the socio-economic needs and aspirations of the rural areas and halt the reckless displacement of the rural poor. To continue to neglect the areas and exploit the poor will, in the nearest future, cause violent conflict in the country. Our leaders should change their thinking and attitude for a peaceful and stable future for the country. The poor in Nigeria are facing miseries and untold difficulties, despite every pretence of government of providing dividends of democracy to the populace. In the matter of roads, hundreds of billions of Naira have been budgeted and spent by government in Nigeria (Federal, States and Local Government Councils) in road construction and maitenance. Despite, the huge sums deployed, the road network in Nigeria has remained a disaster. Many lives have been lost and several persons maimed in avoidable road accidents caused by the dangerous situation of our roads. As you travel the length and breadth of Nigeria, you will notice avoidable accidents and find vehicles that are broken down, especially heavy duty vehicles engaged in haulage businesses. These have a lot of implications on the socio-economic situation of the country. The pitiable situation of the roads in the country has more impact on the poor. The rich travel in good cars, like Hilux jeeps, and other good cars that go through the bad roads without a lot of jerking on the occupants. In many parts of the country, the poor travel ‘jam packed’ like sardines in vehicles, usually, with open roof thereby subjecting them to sunshine and rainfall. This is still the situation in many rural areas. In the urban areas today, tricycle, popularly known as and called Keke, has taken over as intra-city means of transport. As it is cheaper to buy and to maintain. also, they ply routes that taxi cabs and buses do not ply. They equally render road to house service. The triicycles in the countty are low and carry four passengers, excluding the operator. So, traveling with ‘Keke’ during the raining season is an experience. In many States, like Imo State, they are not allowed put any improvise blinds that shield passengers from rain. So, if it is raining, the operator and the passengers are ‘beaten’ by the rain. They are also splashed with water from numerous deep potholes on the roads and from the flood that transverse the roads after rain fall due to the poorly constructed or absence of drainage system in many parts of our urban areas. Interestingly, the issue of poverty alleviation is one that is always mouthed by politicians and those in power in Nigeria. Sadly, there are no good efforts to truly or in real terms alleviate the miseries and poverty of the wretched of our nation. Many Nigerians still live on picks from dust bins. Corruption and ethnicism and sectionalism have blinded our politicians and leaders. The time has, therefore, come for the poor, the oppressed and the marginalized in the country to work with genuine progressive forces for a true change. The ripe off must stop now. When the political elites want to loot and squander our commonwealth, they don’t talk of religion and ethnicity, they are one. When they want to access power to position them for looting, they invoke religion and ethnicity to divide our people. We must stand to be counted now in moving Nigeria forward. THE POOR AND HUNGRY FEEDING THE RICH! More Nigerians are now languishing in the prisons of poverty and misery created by government in alliance with its parastic allies and cohorts. Let it be said that it has become urgent and imperative that the government and its exploitative anti-people alliance must release many of these prisoners now. Otherwise, there could be prison break. This is not a joke. The prisoners are in severe anguish and monumental tension is building up amongst the prisoners.